Manufacturing Olympus microscopes was the principle business in the early years of the Olympus Corporation. Focusing on microscopes and precision lenses, the company didn’t begin manufacturing cameras and other optical devices until 1936. Today, Olympus produces several premium models geared for scientific research. If the BX43, BX53 and the BX63 are on your consideration list then continue reading below. This clinical upright microscope is designed to be flexible and comfortable to use over long periods of time. As with all Olympus Microscopes, major applications target biological, geological, forensic, pharmaceutical, and environmental research. Available with binocular and trinocular observation heads, a new light management system that varies light intensity as magnification changes, works with its 5-position nosepiece to give this microscope greater versatility over other models. Also, a new low magnification condenser allows you to change the objective magnification from 2x to 100x quickly and easily. The motorization of the septuple nosepiece, universal condenser, and fluorescence filter turret make this microscope user friendly. The LED light source allows for highly accurate color reproduction and produces little heat that will cause specimens to deteriorate. These different condensers allow you to employ a variety of contrasting methods such as fluorescence, polarized light, brightfield, differential interference contrast, and phase contrast. As with others from this manufacturer, the BX43 has accessories and peripherals that allow you to tailor the capabilities of the scope to fit the needs of the research. First, a multiple viewing head accessory will allow up to 5 users to view the same specimen simultaneously. Also, a built-in pointer enables professors to direct students’ attention to precise areas of the viewing field. A camera adapter, drawing attachment, and Gout slider kit are available. Several different polarized light accessories can be adapted to the BX43. Plan fluorite objectives offer a high degree of color correction and achromatic objectives will refract light without color aberration. Simply stated, this microscope is suited to performing many tasks, however it doesn’t offer the degree of automation available with other research grade instruments. Scalability is the keyword for this microscope. It is designed as a modular system allowing for the addition of many peripherals and applications to meet varying job requirements. Additionally, it offers some user upgrades that make it easy and comfortable to use. The controls are accessible from both sides of the microscope. The light intensity dial and fluorescence illuminator shutter can also be operated from either side of the unit. The fine focus control can be attached to either side of the scope as well. As on other Olympus microscopes, the binocular tube tilts as much as 27 degrees, extends 55 mm, and lifts as much as 45 mm for comfortable viewing. This scope also has a sensor that turns off the light source when the user is not seated at the instrument for a period of time. Thirteen different observation tubes are available with this unit for maximum viewing utility. In addition to a wide range of condenser types that support all the normally used contrast methods, this microscope has a motorized multi-position universal condenser that integrates with proprietary software to change condenser positions when magnification changes. Ceramic coated coaxial stage with optional rubber grips. Motorized filter turrets for fluorescent illumination are available. No tools are needed to add or remove filter cubes. Also, a large selection of custom cubes for single, dual and triple stained specimens are available. Optional illumination options are available to meet different viewing needs. A 100W halogen light source for brightfield and contrast observations; 100W mercury light; 75W xenon, LED, and metal halide illumination systems for fluorescence microscopy. Multiple head viewing attachments allow for as many as 18 viewers to examine a specimen simultaneously. A built-in pointer allows teachers to direct students’ attention to precise areas of interest. Dual camera ports allow you to attach multiple cameras for digital imaging and spectral microscopy. A full range of polarized light accessories including rotating ball-bearing stages with vernier scales, orthoscopic polarizing attachment, and conoscopic polarizing attachment. Olympus microscopes are noted for versatility and the scalability of this unit will allow for accessory modules to be added to meet currently unanticipated needs. The lack of full computer integration in a unit designed for high end professional use is disappointing. For research and teaching purposes, the BX63 is the top of the line of Olympus microscopes. This is a fixed stage upright microscope making it a very stable platform. Focusing is achieved by using the nosepiece instead of the stage. Completely motorized, the piezoelectric motor delivers smooth and precise movements. Users are able to set X,Y and Z coordinates and navigate to them instantly. Also motorized are the fluorescence illuminator, attenuator wheel to control light intensity, 7 position nosepiece, and universal condenser. Setting this instrument apart from other Olympus microscopes is the unique touch panel controller. This programmable controller handles focus and stage control and has a full range of customizable functions. Also, 30 password protected user accounts can be setup to remember the particular user’s preferences. In addition to the options and accessories available on the BX43 and BX53, the BX63 has an optional remote control unit that can be placed anywhere on the microscope enabling the user to create a custom workspace. The user can control coarse and fine focus, X and Y stage movement, adjust light intensity, camera and fluorescence shutter, and observation method. Also unique among Olympus microscopes are the three different software packages for life sciences use. These packages give the researcher automated control over the imagining process and will integrate with Microsoft Windows and Microsoft Office suites. Of all the Olympus microscopes the BX63 has the most programmable functions which is important when examining large arrays of specimens with different observation methods. This saves time and increases accuracy. This family of Olympus microscopes build upon the features of its predecessor and finally culminates in the BX63. All of them are very agile and adaptable in the area of fluorescence and polarized light microscopy. However, the BX63 is the only one that truly has a high degree of computer control available. 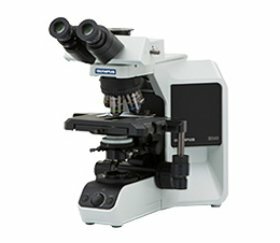 The BH2; BX41 and BX51 models might be worth checking out as the BH line of microscopes were trusted old-timers in many laboratories and the earlier BX models are real dependable friends in the bench top area. For further reading and clarification on Olympus Models that could best suit your microscopy requirements, follow this link on Olympus Microscope Reviews. Understanding the Compound Light Microscope in all its glory can certainly help to better clarify your needs.